Happy Sunday, all! So glad you enjoyed the little sneak peek into Steven’s and my home cooking routine (if you missed it, my boyfriend shared a roundup of his 10 favorite vegan recipes). I’m in Chicago, waiting to fly back to NYC before a blizzard hits. Here are the recipes and reads that are keeping me company. 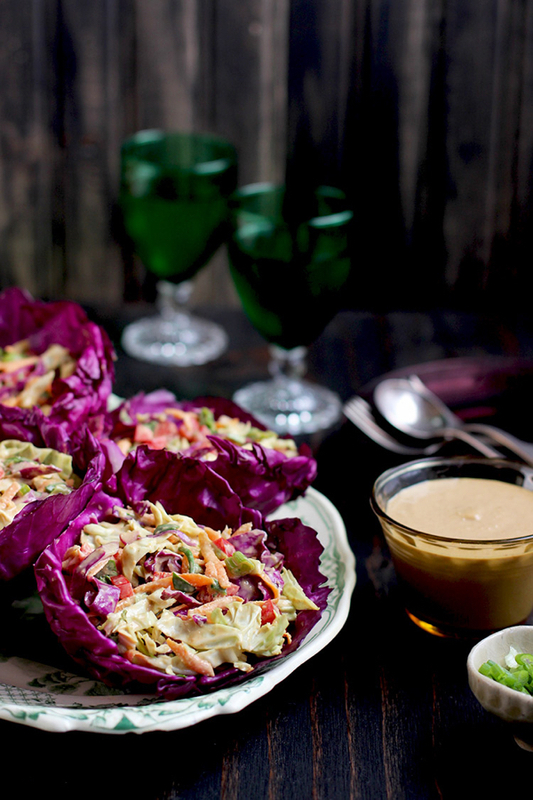 I’m loving this simple, yet brightly colorful Asian style peanut slaw, and the lovely cabbage cup presentation! Speaking of peanuts, these Thai peanut sweet potato skins are making me drool. So good! 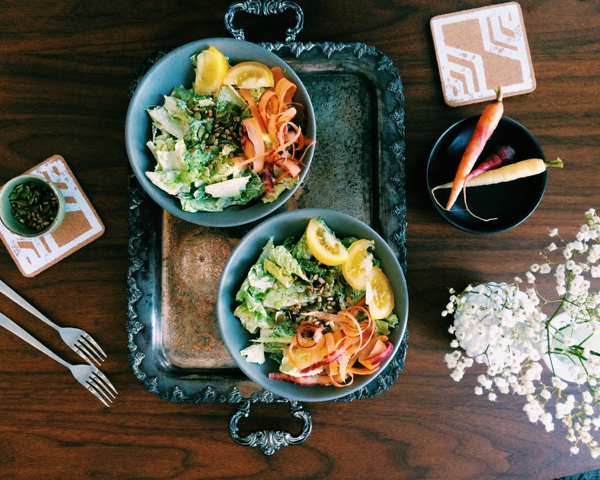 There are a ton of recipes for vegan caesar salad out there, but this one–with its bright colors and simple instructions–really caught my eye. 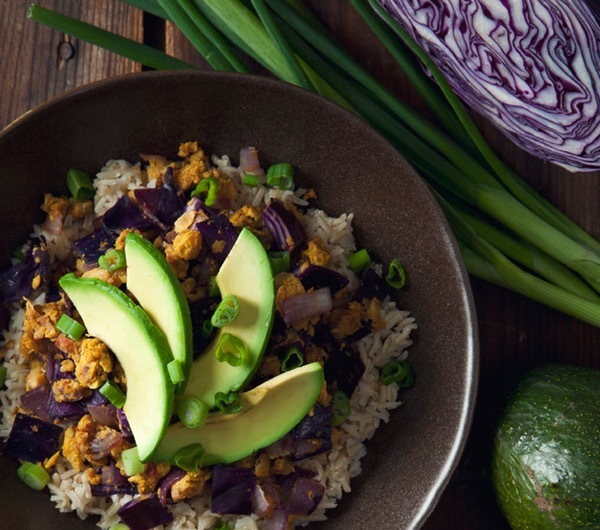 A perfect winter concoction from my friend Amanda: chickpea scramble red cabbage brown rice bowls. Perfect comfort food. And who could forget dessert? 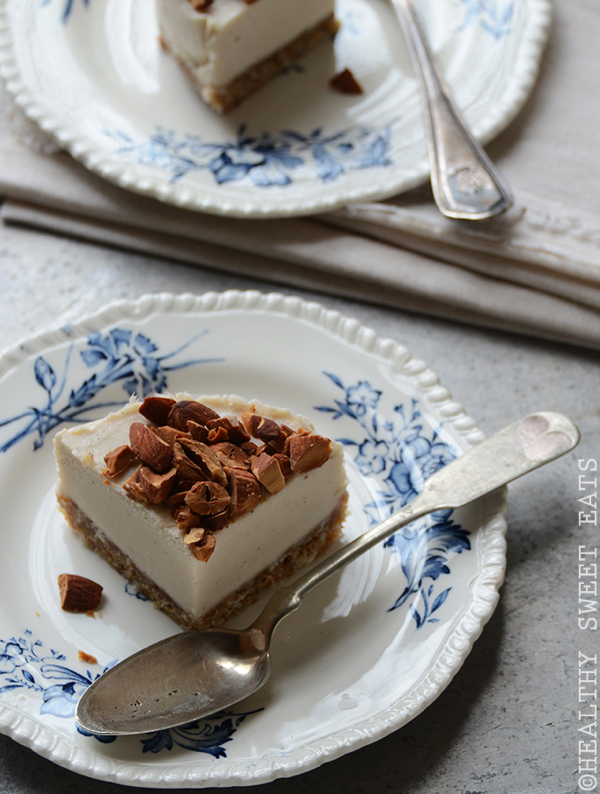 These no-bake, raw vegan mini vanilla almond cheesecakes from Faith of Healthy Sweet Eats are divine. 1. This is a provocative review of what seems to be an equally provocative book: a critique of the “wellness” movement in our day and age. While I think it’s probably a bit overly simplistic and critical, I must confess that much of this review resonated with me, starting with the allegation that our concept of “wellness” has become somewhat monochromatic and constrained. Rather than acknowledging that wellness can take infinite shapes and forms, depending on the individual, we try to codify wellness, capturing it in apps, footstep monitors, fitness regimens, and particular diets. “Our concern,” the authors explain in general, “is how wellness has become an ideology.” And this is particularly revealing in “the prevailing attitudes towards those who fail to look after their bodies. These people are demonised as lazy, feeble or weak-willed. They are seen as obscene deviants, unlawfully and unabashedly enjoying what every sensible person should resist.” The common answer in our day is all too revealing: the poor and degenerate don’t deserve decent housing or a basic income; they just need to be taught how to cook. Indeed, the authors point out, the ideology of wellness shares with the controversial movement in psychology called “positive thinking” the twin assumptions that: a) you can be whatever you want to be; and therefore b) if anything bad happens to you, it’s no one’s fault but your own. In this way, the apparent optimism of the public encouragement to “wellness” hides a brutal, libertarian lack of compassion. This resonates with me a lot; it’s part of what I’ve been trying to articulate with some of my posts about the culture of health shaming. There is a balance between sensible public health initiatives and a celebration of healthy eating and a culture that turns wellness into a kind of monolithic moral imperative. Hopefully we can find it. 2. A horrifying article (with some graphic images, be warned) about animal experimentation in the quest for more profitable farming. 3. Roma tomato sushi? Believe it. 4. NYC may be (officially) instituting Meatless Monday! Hip hip hooray. 5. Fascinating: the transfer of a peanut allergy from one individual to another following a lung transplant. That’s all they wrote for tonight, friends. In the time I spent drafting this post, I made it home safely, and now I’m preparing myself for snow 🙂 Have a great night, and I’ll return soon. I very much enjoyed your comments on wellness this week. As a visiting nurse I often spend time thinking about this topic; what it means for me, and what it means for my patients. For example, many of my past patient’s who have a diagnosis of diabetes become so overwhelmed by monitoring their blood sugars, learning to manage their medication, and “counting their carbs” that they kind of give up and give in to the idea that they don’t have any control over their health. They often feel ashamed and embarrassed, which is so sad, and means that my profession is failing them. I find that helping them to set personal, realistic, achievable goals and celebrating each success as a victory towards their wellness makes a happier, healthier patient and in the end measurable (but not perfect) progress is made! I would add to that article about wellness that the quest for ‘optimal wellness’ has really gotten under my skin. Paleo circles in particular love to use this, and discuss how, if you want “optimal” wellness, then you need to get certain nutrients from animals so your body doesn’t have to ‘do the work’ to convert into a useable form. Healthy people are claiming to be sick with imagined ailments, and spending thousands of dollars on functional/alternative practitioners to achieve this elusive state of ‘optimal wellness’ where they have boundless energy, perfect skin, an ideal weight, defined muscles, optimal digestion, and constant mental clarity. Is that where we’re at? Imagining ailments when we aren’t the perfect paragon of health, and paying gurus to get us to health nirvana? I’m not sure if we’ve just lost the plot completely, or if we’ve just redesigned it in such a way that it’s incomprehensible. Sorry, this is a bit of a soap box, but I think the ‘redefined wellness’ the article speaks of is already here. And all it’s done is made the criteria more comprehensive and more elusive. It’s also led many people away from their values and away from the ability to recognise when they can stop – when they can be content with something less than perfection – in the search for ‘optimal wellness’. 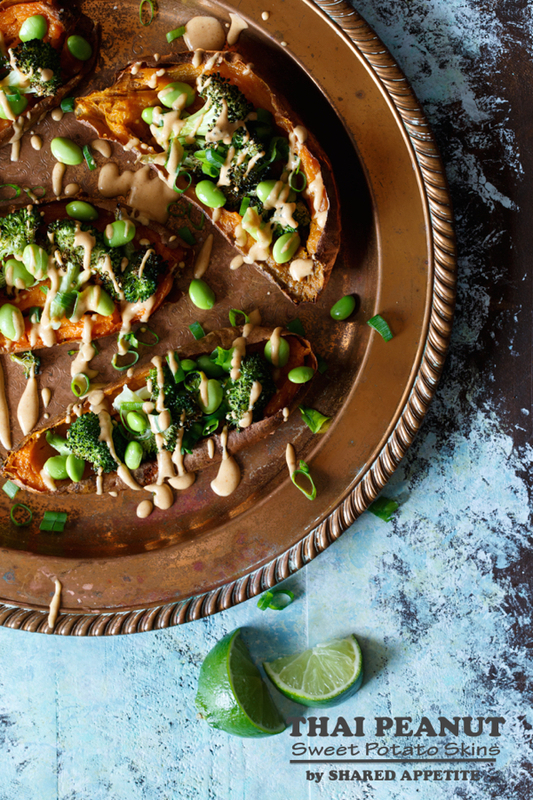 Thanks so much for featuring my Thai Peanut Sweet Potato Skins! Much appreciated! Happy Monday 🙂 ….and I hope you made it back to NYC okay before this crazy blizzard hits us soon! Woh! 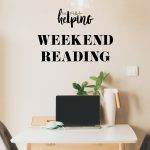 Some really interesting reads this week! Thanks Gina! Thanks so much for the shout-out on my cheesecake! 🙂 I’m dying to try that Asian style peanut slaw – yum!! this is another great list, I am dying to make those potato skins! Kabuki Sushi, a chain sushi place has a ton of vegetarian sushi options now and they use a variety of roasted red peppers to moch fish in their sushi! I eat it all the time and it’s definitely delicious. Glad more restaurants are thinking about replacing the fish!